World First and our legal services partner are also processing a legal liability claim for the Crispin's to compensate them for any financial disadvantage and inconvenience the accident has caused them. Mr and Mrs Crispin are very well travelled and fortunately, up until a recent holiday in Europe last year; all their trips had been free of health incidents. But when things went wrong their World First policy and the service they received from us and our associates was the saving grace. Whilst abroad, Mrs Crispin suffered a bad fall caused by tripping on a badly maintained pavement. The poor lady fell and caught the right side of her face on a kerb stone. Mrs Crispin needed immediate admission to hospital. Examinations by the doctor and surgeon determined she needed an operation to repair her right eye socket and remove bone fragments from soft tissue in her face. Mr Crispin was only able to call our emergency number at around 11pm having been extremely busy ensuring his wife was comfortable and he had left his phone in their apartment when they had gone out. He received fantastic attention; the reassuring professionalism, genuine concern and will to do everything possible to ease their situation immediately lifted much of his stress and worry. Mr Crispin was offered early repatriation for them both and they could choose between surgery being carried out at home or abroad. Although he had got by with the help of the hospital team and staff from their apartment he could also have had an interpreter available over the phone. Mr and Mrs Crispin agreed, in consultation with the Spanish surgeon, that she should have a few days rest to recover from the shock of the fall and allow the swelling in her face to subside. They opted for surgery to be carried out back home, as they would feel more confident and in control being able to converse with the medical team in English. Mr Crispin informed our emergency assistance provider of their decisions so they would return to the UK as planned. We stayed in regular contact to check on Mrs Crispin's progress and ensure everything was in place to make their journey home as comfortable as possible. 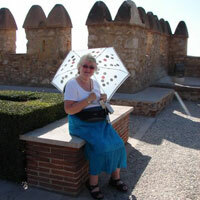 Mr Crispin is tremendously grateful and loyal to World First Travel Insurance. He says, "We've been customers of World First for just a couple of years, coming to them having read recommendations in The Telegraph. Because of my health, having had a minor stroke several years ago, and our age they offer us the best value cover and this is backed up with wonderful customer service. I recommend them most highly."